Look out St. Louis, Tinkerbell could be anywhere! If you see a baby Tyrannosaurus Rex wandering around Forest Park, stay calm. You haven’t entered some alternate universe or stumbled onto the set of another Jurassic Park movie—it's just Tinkerbell, and he doesn’t bite. “I’ve seen some adults go into a full-blown panic attack,” says Gina Dollinger, who is the owner, and sometimes operator, of the dinosaur making appearances around St. Louis. OK, so Tinkerbell isn’t a real dinosaur; it's just a suit. But that suit’s ability to move its neck around, open its mouth and let out a "rawr" can inspire some anxiety in whoever crosses its path. “It’s not your average costume,” Dollinger says. The suit itself weighs 70 pounds. It was originally made from welded aluminum and steel and the kind of foam you’d find in a couch cushion, all enclosed by a painted-latex skin. Dollinger says she and her husband, Paul, who are both residents of St. Ann, have reconstructed the insides with PVC pipe in order to make it lighter. Tinkerbell is controlled by whoever is wearing the suit—a task that keeps the person pretty busy. The head, neck, eyes and mouth are all controlled using a handlebar-type armature from a bicycle. The operator can choose different sound effects from a tablet, which are emitted from a speaker hidden in the tongue. Dollinger bought Tinkerbell in May 2015. It wasn't an easy find. After doing research, she found out that the suits were only made overseas in the UK or in Asian countries — and they cost about $10,000, even without factoring the costs of shipping to St. Louis. 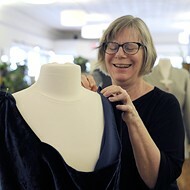 Dollnger and her husband tried to making a suit on their own, but then they found a man in Iowa who was willing to sell one that he'd purchased in Singapore. The suit ended up being $4,600, but that was before the upgrades were made. Dollinger says she stopped counting how much money they were spending once it hit $5,000. “We’re just everyday people who instead of buying a new fancy car or a vacation to Hawaii, or whatever, we decided to buy a dinosaur,” Dollinger laughs. Although most of the time you’ll see Tinkerbell in the park, at birthday parties or local events like Heat-Up St. Louis as part of Dollinger's business, Rawr STL, that was not his original purpose. “We wanted to have one of these very realistic dinosaurs in our haunted house,” says Dollinger. That haunted house, Crystal City Underground, is no longer operational due to its distance from the city and the heavy flooding that happened last December. “It was just too doggone far away — no matter how wonderful our haunted house was, people weren’t willing to make the drive, but it also flooded. Where our area was is still six feet underwater right now. So it’s like we’re now homeless." Dollinger and her husband are looking for another space for their haunted house. In the mean time, though, they’re getting a kick out of their interactions with the community.